Ralph Waldo Emerson once said, “life is a journey, not a destination,” and the same applies to conversion rate optimization (CRO). No matter how many goals you set up in Google Analytics, it won’t mean much if you have zero insight into how your visitors are reaching those goals. As part of your overarching benchmarking process, you need to be able to track user movements across your site to see (a) what elements are leading to conversions and (b) what elements are hindering conversions. That’s where funnels come in. If you’re not tracking visitors with funnels yet, it’s time to start. A funnel is a path that your visitors take on your site before completing a goal. The number of steps in a funnel varies depending on your visitors, your goals, and how sophisticated your CRO strategy is. Visitor navigates to a landing page via search engine. Visitor reads the landing page content. Visitor fills out and submits a contact form to receive more information — that’s a conversion! Of course, there are many funnels that are vastly more complicated than the one outlined above. Some funnels can last for days over the course of multiple sessions — you’ll often see this with customers who are scoping out their options or mulling over a purchase. By tracking these users, you can encourage them further through retargeting campaigns. Funnel tracking is critical because it allows you to identify potential friction points along your visitor’s path and ultimately, help foster meaningful conversions. By leveraging both Google Analytics and Google Tag Manager to establish your goals and set up funnel tracking, you can track how visitors are interacting with various site elements (such as external links, clickable downloads, form submissions, e-commerce purchases, video plays, and more). Once you understand how your visitors are moving through your site and interacting with its elements and features, you can more concretely determine how and where to focus your CRO efforts. Looking for more granular data and visualizations about how your users move through your site? There are dozens of user movement tracking tools out there that take an even deeper dive into the customer journey. A mouse tracking heatmap of Wikipedia’s main page. The most common type of user movement tracking tool is mouse tracking, which allows you to track cursor movements — whether it be actual clicks or just where the cursor is hovering. 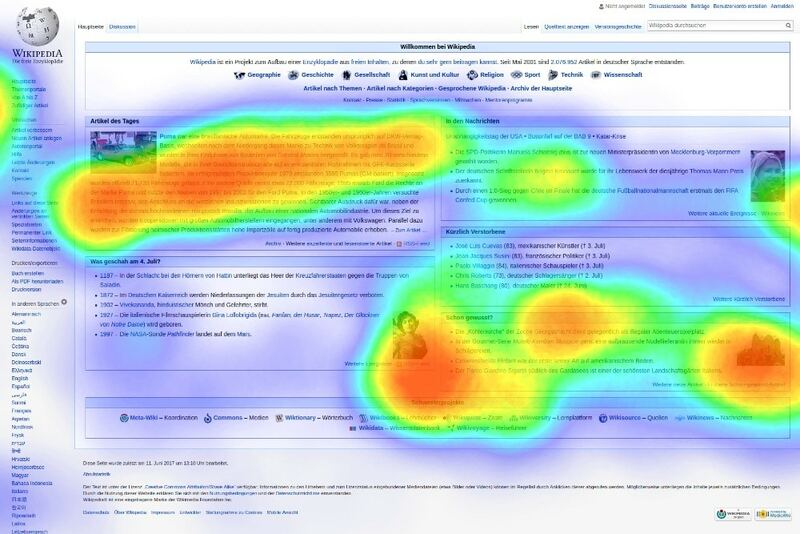 One of the most common ways to visualize mouse tracking is through heatmapping, which offers a colorful representation of the “hottest” areas where people click or hover on your site. If you’re looking for an even more granular way to track user movements, you can’t get more granular than session replays. Session replays are recorded playback videos of each of your users’ sessions — where they clicked, how they scrolled, what pages they visited, and more. Some of the most popular user movement tracking tools for mouse tracking, heatmapping, and session recordings include CrazyEgg, Inspeclet, and FullStory. These tools offer incredibly valuable insight if you’re trying to (a) test the efficacy of navigational menu and call-to-action placements, (b) diagnose friction points in your conversion funnels, or (c) reproduce bugs that are damaging the user experience. Of course, mouse tracking, heatmapping, and session recordings do have their limits. For one, there is an inherent lack of context for each user’s activity, so you are forced to make guesses about why users interacted (or did not interact) with particular elements. After all, just because someone’s cursor hovers over something doesn’t mean they were actually looking at it. Because of this uncertainty, data is not super exact, which can make it a challenge to analyze. When it comes to analyzing session playbacks, in particular, you’re not always guaranteed valuable insights in every recording. That’s why, if you not careful. The process for analyzing every single user session can be incredibly time-consuming — ultimately, the data may always not be worth the time and effort. Due to the immense amount of data gleaned from visitor tracking tools, you need to be strategic about how you’re parsing and integrating it into your larger funnel tracking strategy. Fortunately, understanding the strengths and weaknesses of user movement tracking tools empowers you to feel more confident about what type of data is meaningful for your ultimate conversion goals.